Financial Management & Financial Planning - A requirement under the Local Government Act is for the Village to prepare a five-year annual financial plan or budget. In addition there must be a public consultation process prior to the plan being adopted by Council on May 15th. The Village holds meetings where the budget receives a detailed review by Council. Cash, Portfolio, and Debt Management - The Village manages cash balances and we are tasked with investing surplus cash to maximize the return on investment, ensuring that the investment is secure and taxpayer's funds are not at risk. The investments must also provide for correct timing to ensure that funds are available as required to meet the Village's commitments. Our department initiates the required bylaws and supporting information related to long and short term borrowing, maintaining the records related to these borrowings, including the value of sinking funds associated with long-term debt. Accounting and Payroll Services - The accounting records for the Village are maintained by our office. We provide periodic financial statements for both internal and external use, prepare the annual budget, and advise both Council and other Departments on budget impacts of current events or upcoming issues. Collection of Tax and Utility Fees - We are available all day between the hours of 8:00 AM and 4:30 PM to receive payment for all fees and charges levied by the Village. These include utility bills, property tax notices, other invoices, business licences, building permits, development fees, and miscellaneous fees. The Village generally accepts cash, cheques and debit cards. Under certain circumstances there may be a requirement for payment by way of a certified cheque or bank draft. To avoid line-ups, particularly during due dates for taxes and utilities, you are encouraged to drop-off or mail in post dated cheques. However, you must ensure that these payments are received prior to the due date to avoid a penalty. Cemetery - The Village is responsible for the operation of Cemetery, the sale of cemetery plots, internment permits, marker permits, scheduling burials and the maintenance of burial records. The operation of the cemetery is subject to the Provincial laws and regulations as well as the Village bylaw. The Village bylaw provides for control of plot sizes, headstone markers, flower stands and related items. It also provides for fees for internments and related costs. ICBC and Motor Vehicle - The Village provides ICBC services for Autoplan renewal, etc. Motor Vehicle transactions such as Drivers Licence renewal. BC ID application, Traffic Fine payments and Road Test study guides are also available. Dealing with monetary issues can be confusing. We understand. 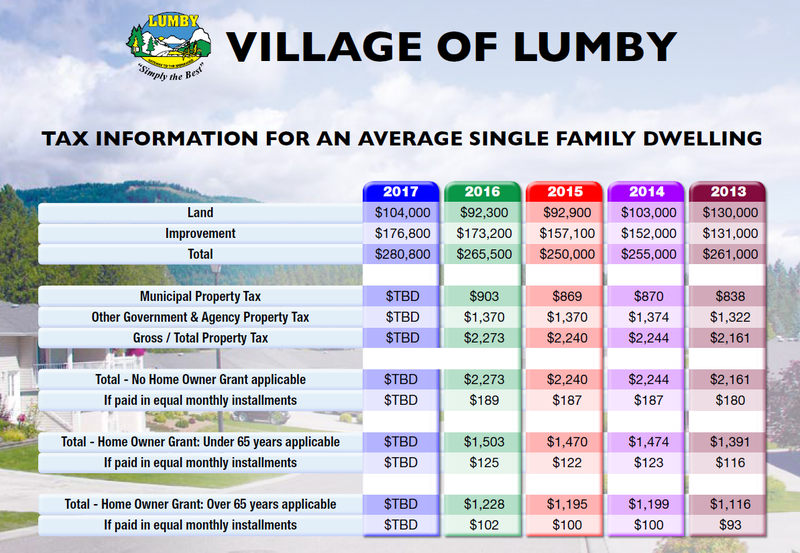 The friendly professionals of the Village of Lumby Finance Department are pleased to help you with your financial needs in a manner that makes sense to you. The formula for calculating taxes on property is = Tax rate x assessed value. The tax rate is expressed as a dollar amount on every $1,000 of assessed value. If the tax rate for residential property is 7, this means that taxes of $7 are charged on every $1,000 of assessed value. Property valued at $100,000 would thus be charged taxes of $700 (100 x $7). The assessed value of property for tax purposes is determined by the British Columbia Assessment Authority. The Authority is established under provincial legislation, and is independent of the municipality. The Village is not involved in determining assessed values. Taxation on property is the primary source of municipal revenue. The Local Government Act, which is a Provincial Act, sets out in detail the regulations for property taxation. The amount of money to be raised through taxation is set by Council through the budget process, but other aspects of the taxation process, such as the due date for taxes and the penalty on late taxes, are regulated by the Local Government Act. Council does not have the power to adjust the taxes on individual properties. The taxes are set by the tax rate which applies to that class of property. For instance, if the tax rate for residential property is 7, then ALL residential properties must be charged this rate. What is included on my annual Tax Notice? RDNO (Imp) These are remitted to the Regional District of North Okanagan for functions based on Improvements Assessments only. OK Library These are taxes imposed by the Okanagan Regional Library Board. All of these tax levies are NOT set by the Village, but are collected by the Village on behalf of those governing jurisdictions. This is more efficient and economical than each of these tax authorities sending individual tax notices. Your Village Council sets the rates only for Village taxes and Local Services Taxes. Property taxes cover the fiscal year - January 1 to December 31 - and are due the first business day in July. Under the Local Government Act, the municipality must charge a 10% penalty on late taxes. Payment can be made by cash, cheque, money order or debit card at the Village Office. Payment can also be made by your mortgage company. Payment by way of post-dated cheque is encouraged. Send the cheque with your completed and signed Home Owner Grant application to the Village Office. Leave plenty of time for mail delivery, as postmarks will NOT be considered as date of payment. What is the Home Owner Grant? Am I eligible to claim it? be shown on the title as a registered owner. The grant cannot be claimed on vacant land. Only ONE grant is allowed for each property, and you can only claim the grant once each year. When there are joint owners or multiple owners on title, any ONE owner on the title can claim the grant. If the property is registered to a company, no grant can be claimed. If your mortgage company is paying your taxes, you must still complete the Grant application and ensure it is received by the Village by the tax due date to avoid Penalty charges. An additional grant of up to $275 is available for seniors (age 65 or will be turning 65 in the current year) and persons with permanent physical disabilities. However, it cannot reduce the amount payable to below $100. Please ensure you enter the date of your birth. If you are a person with disabilities, or are the spouse or relative of a person with disabilities and that person lives with you, you may be eligible for the disability grant. The disability must be permanent and must require extensive physical assistance or costly modifications to the home to be eligible. Your doctor must complete the appropriate form to certify the disability. These forms are available at the Village Municipal Office. If the registered owner of the property is recently deceased, a relative may claim the grant, but only if they were living with the deceased at time of death, and a re living in the home when they claim the grant. New owners, whose names are not yet on the property tax notice, must produce a copy of their Certificate of Title when claiming the Home Owner Grant. Your password is located directly below the due date on your property tax notice. A confirmation number will appear on screen after eHOG is claimed. For more information, contact the Property Tax Department at (250) 547-2171.